NASHVILLE — Elijah MacNamee’s bat is responsible for sending Mississippi State to a Super Regional. 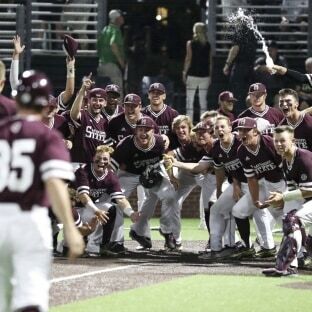 Now, MacNamee’s bat is the reason the Bulldogs are one win away from advancing to the College World Series. MacNamee homered twice on Friday night, including a walk-off two-run shot in the bottom of the ninth to defeat Vanderbilt 10-8 in Game 1 of the Nashville Regional. It was the Bulldogs’ sixth walk-off win of the season and MacNamee’s team-leading eighth home run, all of which have come over the last 15 games. The junior right fielder now has five long balls during the NCAA Tournament. Game 2 is slated for an 8:30 p.m. start tonight on ESPN. The Diamond Dogs will send junior left-hander Konnor Pilkington (2-6, 4.61 ERA) to the mound while the Commodores have not announced a starter. Friday’s affair was a wild one featuring a pair of five-run half-innings and seven combined errors. State (37-25) overcame four errors with 11 hits led by MacNamee going 3 for 5 with a pair of homers and five runs batted in. Hunter Stovall was also 3 for 5 driving in one and Tanner Allen went 2 for 5 with one RBI. Riley Self improved to 5-0 throwing 15 pitches in his one inning of relief. The Bulldogs also received a stellar bullpen showing by Cole Gordon, who tossed 3 1/3 shutout frames and only allowed one hit. Mississippi State struck first with a pair of runs in the bottom of the second. With the bases loaded and one out, Dustin Skelton struck a low liner to second that Ethan Paul caught on a hop and tagged second for the out. But Paul’s double play throw was wide allowing the Bulldogs to score two on the play. MSU gave those runs right back in the next frame as four different defensive lapses allowed Vanderbilt to tie the game back up. The Bulldog bats regained the lead by putting up a five-spot in the bottom of the third. Allen and Stovall each provided an RBI single before MacNamee launched a three-run shot into the left field stands off Vandy starter Drake Fellows. The 7-2 lead would be short-lived however as the Commodores scored five of their own in their next at bat. A wild pitch, throwing error and passed ball plated the first three runs and chased State starter Ethan Small. Pat DeMarco then drilled a two-run homer off JP France to tie things up. State seemed to be in good shape after Jake Mangum provided an RBI single in the bottom of the eighth to retake the lead but DeMarco struck again. The Vandy freshman lifted a ball to the track in left that ricocheted off the wall and Rowdey Jordan’s glove. DeMarco stumbled rounding second and the relay throw hit him sliding into third. He alertly scurried towards home and the throw from Luke Alexander was off the mark. The Commodores (34-26) had 10 hits paced by DeMarco going 3 for 5 with a homer, triple and two RBIs. Vanderbilt only used two pitchers in the contest with Zach King taking the loss and dropping to 1-4 after four innings of work. This article is written by Logan Lowery from Northeast Mississippi Daily Journal, Tupelo and was legally licensed via the Tribune Content Agency through the NewsCred publisher network. Please direct all licensing questions to legal@newscred.com.